Devolver Digital reveals RUINER, a cyberpunk anime-inspired action shooter from Polish developer Reikon Games. The story takes place in 2091 in the city of Rengkok. The game will release later this year on PC, Mac and Linux. More details, trailer and screens after the jump. 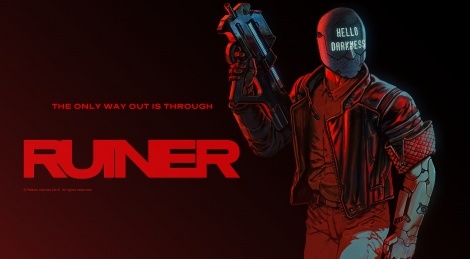 Developer Reikon Games and game label Devolver Digital have announced RUINER, a brutal cyberpunk action shooter that will devastate gamers on PC, Mac, and Linux in 2016. Throw up your energy shield and refresh your dash augmentations because it’s going to get pretty wild from here on out. “The Reikon Games team is thrilled to work with Devolver Digital on our debut game. RUINER is a game we’ve been working on for quite some time and have wanted to make for even longer,” said Magdalena Tomkowicz, lead writer on RUINER at Reikon Games. Reflexes will be put to the test as players take aim at HEAVEN, the monolithic corporation behind the entertainment networks bringing people real sensations in virtual worlds. The masked hero will utilize a fantastic array of weaponry and gadgets in concert with fluid movement and tactical strikes to save his kin and discover the hidden truths of Rengkok. A sensational score from Khoven, DJ Alina, and famed anime composer Susumu Hirasawa (Paprika, Millennium Actress) back a unique original narrative. If you or someone you love is looking to become an unstoppable psychopath with a super sweet video helmet strapped to their face, please visit ruinergame.com and follow @RuinerGame on Twitter. Looks great. Thanks for news, I didn´t see this one. Agree with Zat and I love the Cyberpunk setting! Saw this earlier, and it looks so good. It's like a cyberpunk version of Dead Nation. I can get behind that.